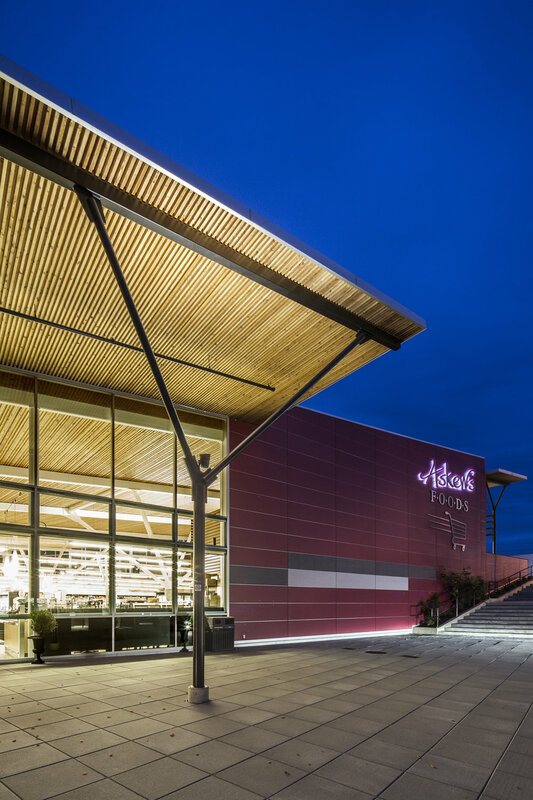 The 32,000 square foot timber roof of the Askew’s food store forms the heart of an architectural concept which puts the ecological, economic and cultural sustainability of the community first. First, the building takes a vacant lot in a typical commercial strip and reimagines it as an urban space, with a mix of housing, office and commercial use on site. Walking and bicycle access is encouraged, and the frontage road is endowed with sidewalks, street trees and parallel parking. Rather than present a parking lot to the street, the building forms a continuous glazed street wall, with parking contained in an urban square at the centre of the site. 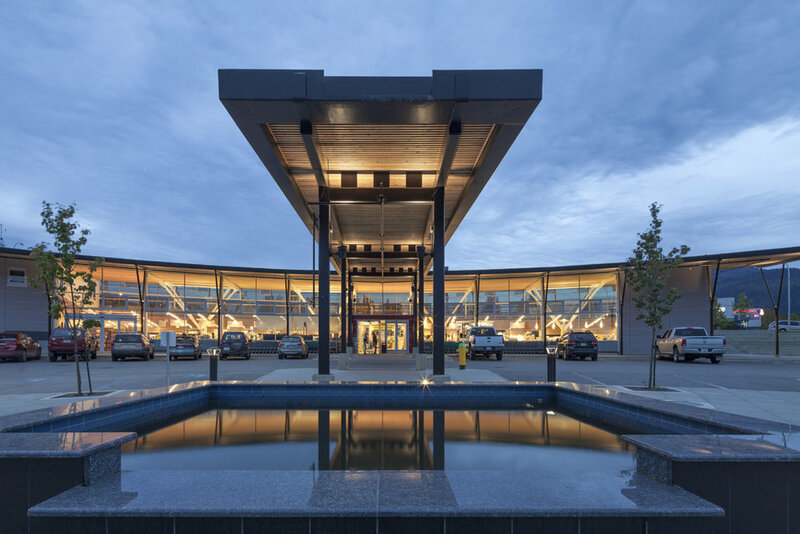 The building achieves a 43% reduction in energy use compared to a typical grocery store, through the re-use of waste refrigeration heat, in floor heating, natural ventilation, ample glazing for daylighting, light-sensing dimmers, and exterior shading. Second, the building is a statement of community support from a family owned business which has been operating in Salmon Arm for 80 years. 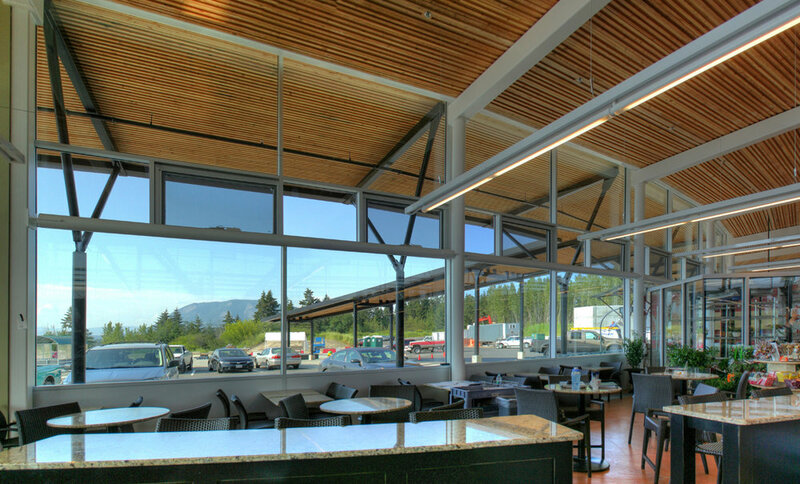 The design of the timber roof allowed for competetive pricing from 5 local sawmills on 245,000 board feet of dimensional lumber, and pre-fabrication in a local warehouse by a team of experienced carpenters. This ripple effect of local employment and involvement not only sustains the community, it earns customer loyalty. Finally, the building is a work of art which expresses the particular site, materials and experience of Salmon Arm. It settles itself into and under the hillside, becoming the retaining wall which reconciles the level of the street with the urban square below. A sweeping roof of douglas fir creates a light filled space, open to views of the surrounding mountains. And the rainwater from this roof is channelled over the front entry to a waterfall edge, which turns the frequent downpours in this lush valley into a visual spectacle, while recharging the undergound cistern that irrigates the street trees and landscape. The use of locally harvested douglas fir, in a minimally processed form, dramatically reduces transportation, and concentrates labour in the local economy. The placement of all building activities, inside and out, under a unified wooden canopy expresses the wood culture of the region.